If you believe Game of Thrones, then Winter is Now Here. Luckily, however, we’re not in Westeros and winter is not here. I wouldn’t exactly call it summer either though, it hasn’t stopped raining for days. That aside, on the odd occasion the sun does come out, it really puts me in the mood for tomato soup. Vegetarian tomato soup certainly, and vegan tomato soup if possible. My tomato plants are also doing really well, so it would be a crime not to use all those lovely homegrown tomatoes. FYI – growing tomatoes is really easy – all you need is a bit of room (ours grow on a small city balcony). Planting them next to basil is widely regarded to both keep insects away from the plants and increase tomato flavour (as well as some other cool planting ideas). The pairing is one of the best in terms of eatability too – it’s a great combination. If you’re after more great combos, then the Vegetarian Flavour Bible is a really good place to start, it’s a book we learnt a lot from. 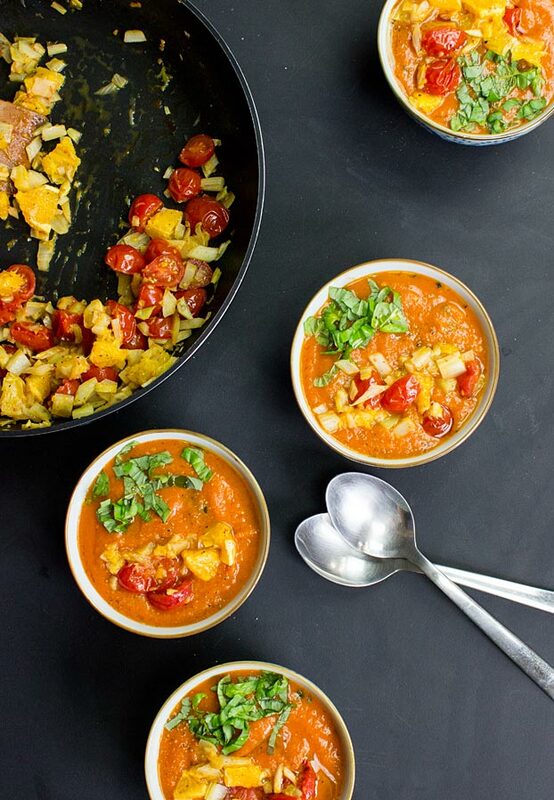 If we’ve established that it is indeed summer, then vegan tomato soup is the perfect choice. It’s light, fresh and with a real burst of flavour. And the best thing? It tastes even better the next day, so you can either prep it in advance or eat it for days, which really is no punishment. Wait, did I say best thing? That’s not even the best thing! 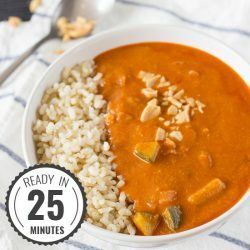 This vegan tomato soup can be made the regular way (awesome) or the pimped up way (super awesome!). It all depends on how much effort you want to make, and who you want to impress. 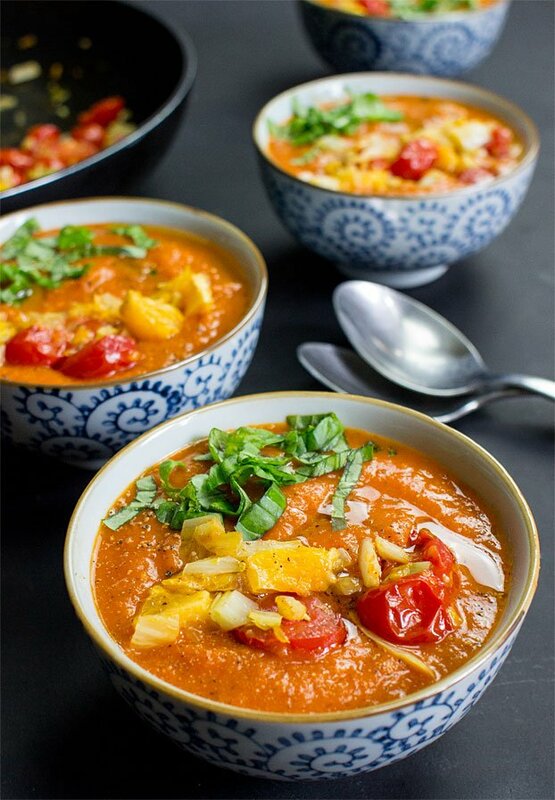 Vegan Tomato Soup – need more? I’ve still got more by the way – this soup is a real versatile mofo. 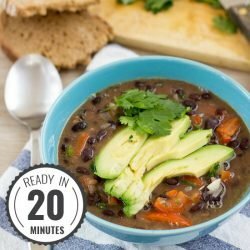 It’s nice and thick, so not only is it filling, you can use it as more than ‘just’ soup. The first time round I made so much of it I couldn’t possibly eat so many bowls of soup, so I used it as a base for a pasta and sauce meal. Needless to say, it was great. 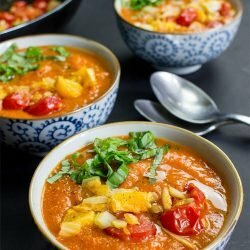 So many tomato soups are made with cheese or butter or cream, and for those of you who want to keep your dairy intake low, or just want to eat vegan, this recipe is there to prove it really can be done. In style. Without dairy it’s also a lot lower in calories and fat. If that’s important to you, head over here for your free weight loss meal plan. Before we finish, we’d like to say a big thank you to Timo, the head chef of the Ratskeller in Oldenburg, Germany, and good friend of Hauke’s sister, for letting us share this amazing recipe. If you’d like to try more of his creations, then head to the restaurant to check it out! 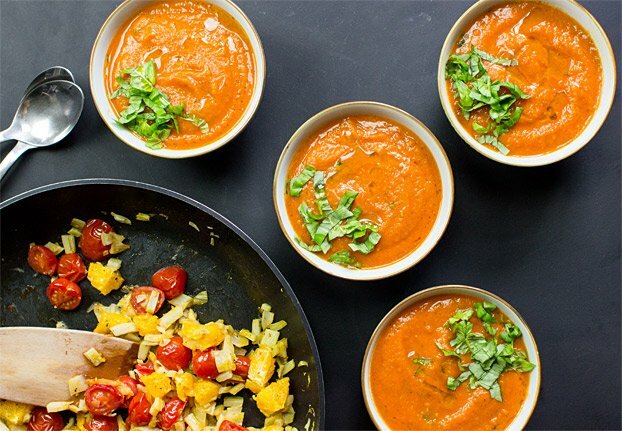 Show the competition why there’s only one winner with this creamy vegan and vegetarian tomato soup. No dairy, just awesome. Wash and roughly chop the carrots, celery and potatoes. You can leave the potato skin on if you like. Just make sure to give them a quick scrub first. 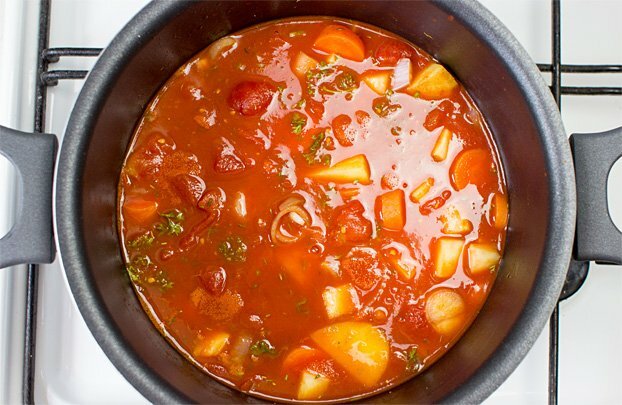 Add it all (with a shot of olive oil) to a pot and let it simmer for 3-5 minutes. A little browning is good. Peel and roughly dice the shallots and garlic, add them to the pot as well. Now stir in the crushed tomatoes, water and orange juice. Let simmer for 30 minutes. Add in the rosemary, thyme, salt, pepper and sugar after 15 minutes. Depending on how you like it, puree the soup with a hand blender. You can make it completely smooth or leave it a little lumpy if that’s your bag. That’s it, ready to serve! Cut the fennel into small cubes (here’s a video on how to do it). Add them with a little olive oil to the pan. Peel and dice up the orange, cut the cherry tomatoes in half. 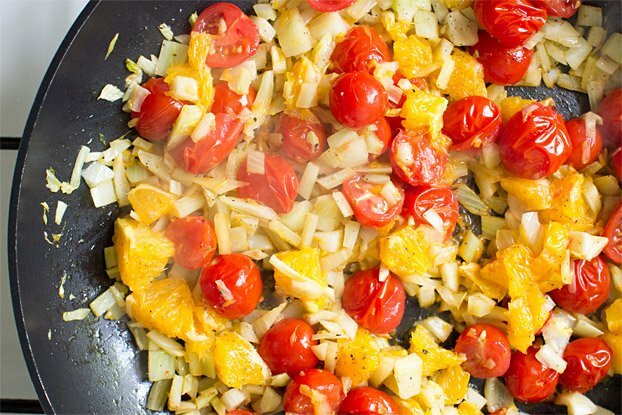 Give both to the fennel pan. Carefully chop the basil and use for garnish. 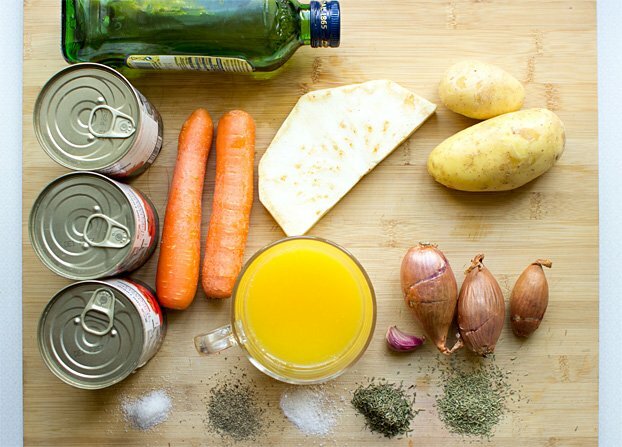 When serving add some of the fennel mix and chopped basil to the soup. Stellar! 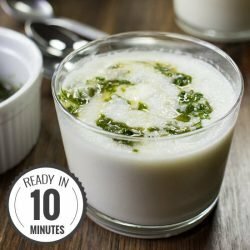 IF YOU LIKED THIS RECIPE: Then you absolutely need to try our other appetizer soups like this Mushroom Soup and this Irresistible Pea and Mint Soup. Both are soo good :D.
Timo, mate! Thanks a ton for the tomato soup. We served it to so many people already. It’s great! 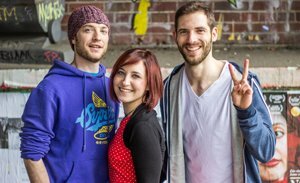 Want to get in contact? Hop over to his Instagram over here! You’re very welcome – I hope she enjoys it! This tomato soup looks so delicious!! I can’t wait to try it, I bet it’s even better than I imagine. Thank you for sharing the recipe! You’re very welcome, Diego, enjoy! Looks good – have a load of tomatoes on my bench from the allotment asking for this recipe! Think celeriac is the same as celery root? Also will use coconut oil for cooking – IMHO olive oil best not heated up too much. I generally pop the skins off fresh tomatoes. Hi Barb, yes, a quick google tells me that’s exactly what it is! Home grown tomatoes = perfect. I’ll be the coconut oil is great in this!